Shopping for Teenage Mutant Ninja Turtles Statues? Michelangelo measures about 10 1/2-inches tall on a ledge base. Statue based on artist James Jean's original Teenage Mutant Ninja Turtles artwork. Pair him with the rest of the team to create a diorama! 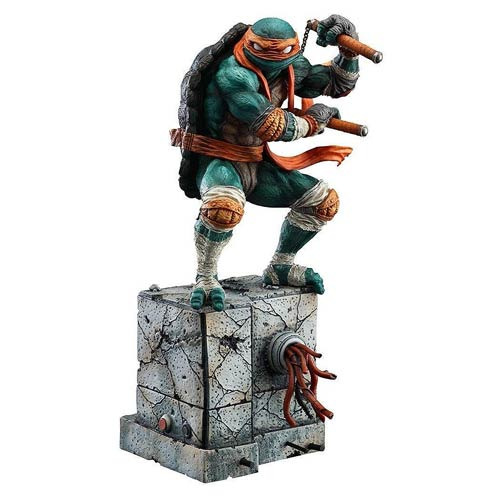 With his nunchaku at the ready, the Turtles' chillest member is ready for action atop a ledge base in this eye-popping ATBC-PVC statue based on artist James Jean's original Teenage Mutant Ninja Turtles artwork. The Teenage Mutant Ninja Turtles Michelangelo James Jean Statue measures about 10 1/2-inches tall and can be paired with the rest of the team to create a diorama of Jean's image! Other Turtles sold separately. Ages 14 and up. As an added bonus to this already amazing statue, Michelangelo comes with a unique code inside the box. By purchasing all 4 Turtles statues (each sold separately), you can obtain an aluminum print of James Jean's artwork that served as the inspiration for these statues! Each code includes a link for redemption, and all 4 unique codes are needed for redemption.